Our open-air restaurant, serves as, not really as a normal restaurant but more like an extra service to our clients. At this moment we are in a transit period with the kitchen. The idea is to change the existing setup more to a coffee shop and hopefully we can finish this process latest January 2019. So, we serve coffee, cake, natural juices, cold drinks, candy bars and some little snacks, like a hamburger and paninis. After a hike it is good to sit down and relax in a natural atmosphere and watch the hummingbirds. And nobody ever gets tired of that view. 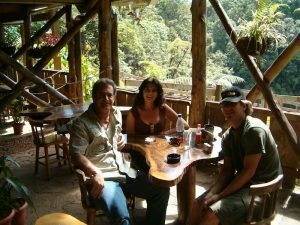 If you are planning to come with more than a few persons to do the trails and waterfall and want to eat please contact us a few days before by phone or e-mail. And the hummingbird multi-flash setup arrangement includes a good meal. And of course, the people staying with us in the rooms will not be hungry.